Big technological advances often start with very humble beginnings. If you’re reading this post on the internet right now, it is almost certain that the information has come to you at some point in the journey in the form of light passing through fiber optic cables. These transparent glass threads almost perfectly trap light within them, allowing it to journey without harm from one end to another. 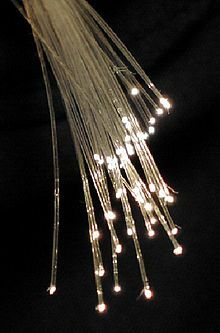 The end of a bundle of fiber optic cables, showing the light emerging. Via Wikipedia. The use of light to carry digital information allows massive amounts of data to be transmitted over long distances in a cheap and efficient manner, and is the foundation of modern telecommunications. Though fiber optics of sufficient quality to be practical are a relatively recent invention dating to the 1960s*, the origin of the light-guiding principle goes back much, much further: about 170 years! 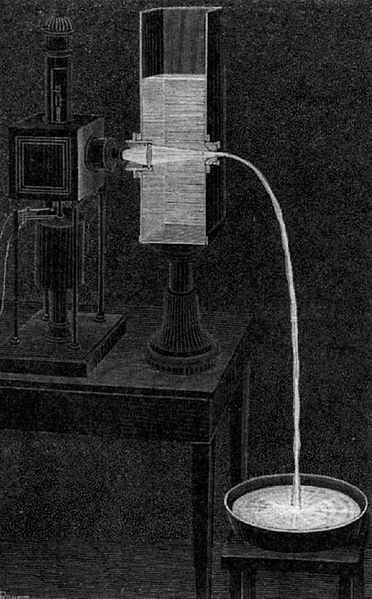 In 1842, Swiss physicist Jean-Daniel Colladon (1802-1893) showed that one can guide light with a falling stream of water — and the experiment is simple enough to do at home, as I will show. First, we make ask the question: how does a fiber optic cable confine light? It seems strange at first glance that light could be trapped within a transparent material and unable to escape, but it is a natural outcome of the principle of refraction, by which light changes direction when it passes from one material to another. I’ve talked about refraction before in a “basics” post, but it is worth summarizing the essentials here. When light passes from an optically “rare” medium, like air, to an optically dense medium, like glass or water, it changes direction, ending up “bending” towards the line perpendicular to the surface. We won’t worry about the details too much here, but as the picture shows, the direction of the light ray entering the denser medium gets bent towards the dashed line. Only part of the light gets transmitted; the rest gets reflected, as shown above as well. 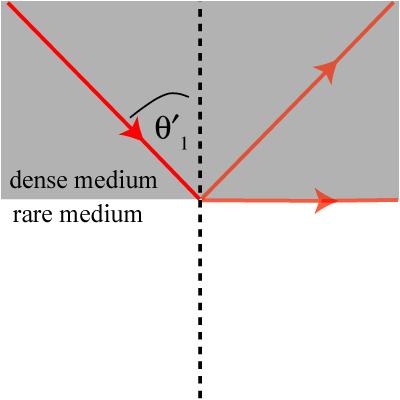 Snell’s law also works perfectly in reverse; that is, if we consider light passing from a denser medium like glass to a rarer medium like air, the transmitted light will be bent away from the axis (dashed line). Things are not completely reversed, however. For one thing, there is not perfect symmetry between the two cases because of the reflected waves. Also, let us suppose that, for the dense-to-rare case, we keep increasing the angle . 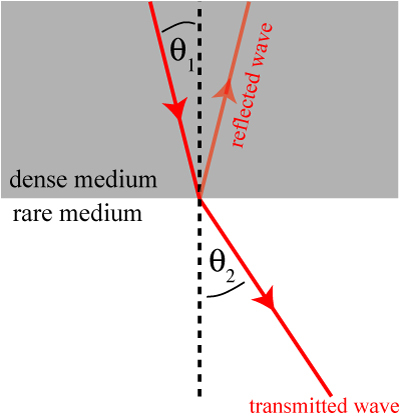 The angle will increase faster, and there will eventually be a critical angle at which the transmitted wave is parallel to the surface! 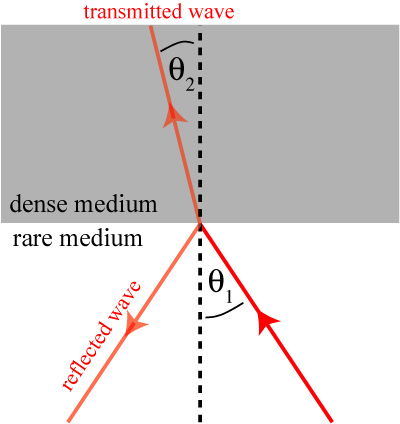 For angles greater than this critical angle, the light will effectively be refracted back into the dense medium instead of being transmitted. All the light is reflected, and we have the phenomenon known as total internal reflection. This total internal reflection is what makes fiber optics work**. When light is put into a thick fiber, it will reflect off of the boundaries of the fiber beyond the critical angle, keeping it bound inside until it exits from the other end (hitting the end at less than the critical angle). A ray of light bouncing in a fiber. In a smaller fiber, the light will not have room to “bounce,” but will still be trapped within, roughly filling the entire interior of the structure. The great thing about this phenomenon is that it can be done with other transparent, optically dense materials — such as a curved stream of water! This was the discovery of Jean-Daniel Colladon in 1842***, although light was initially a secondary concern of his. Colladon was studying the fluid dynamics of jets of water that were emitted horizontally in the air from a nozzle in a container. In performing demonstrations of these jets in a lecture hall, Colladon became irritated that his audience could not clearly see what was happening to the falling water. He then hit upon the idea of directing a beam of light into the stream from the other side of the tank, using the light in the stream to illuminate its behavior. Colladon’s light fountain, from La Nature. Via Wikipedia. An illustration of Colladon’s device is shown above, taken from a later article written in 1884****. On one side of the water tank is fixed a converging lens, to concentrate the light and focus it into the output nozzle on the other side. This nozzle could be adjusted or replaced to produce larger or smaller streams. You might wonder how this helps one see the falling water, if the light is totally confined within the jet — it will only “spill out” when it hits the basin. However, a number of useful variations can be performed to make the stream visible at other points. 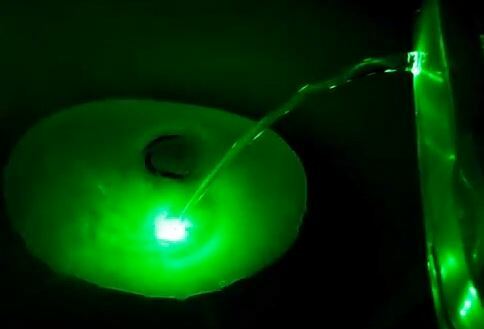 If the water is clouded with a small amount of dust or dirt, the dirt particles will scatter the light and allow it to escape the water tube, potentially making the stream visible throughout its length, though it will be most bright at the nozzle. Also, if the water is dropped from a great height, or a thinner stream is used, the jet will break up in mid-air. The light will then scatter out, making the broken region “sparkle,” as shown in my own experiment below. It is quite easy to reproduce Colladon’s experiment at home. I used a couple of clear plastic containers as my water tanks and drilled holes for the water to flow out. 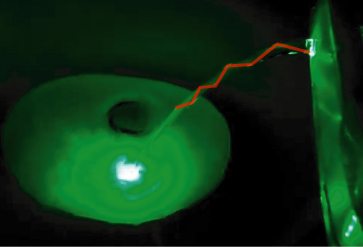 Using a green laser pointer (red and blue are usually too dim to see well), it is unnecessary to attach a lens to the other side of the containers, and the laser pointer can be shined straight through and into the holes. I put together a short video of my experiments that shows the highlights, embedded below. Other fun things that one can do: you can put your hand in the falling stream and confirm that the light in fact shines out wherever the jet is broken. You can also enhance the visibility of the jet by using a small amount of fabric softener to cloud the water as Colladon did. Using this latter trick, I observed something I did not expect! When I reviewed the video, I noticed something quite unusual, which I grabbed a snapshot of below. Look carefully at the falling stream — notice the bright and dark spots on the top and bottom of it? They’re connected by bright lines inside. The laser beam is much thinner than the stream of water — thanks to the fabric softener, what you are seeing is the actual laser beam bouncing around inside the stream, as in my simple illustration earlier! Highlighting the “bouncy” beam of light in the water. Colladon’s experiment is not only a wonderful demonstration of optics but also an inherently beautiful phenomenon. This latter observation was not lost on others, who implemented the trick into decorative fountains. 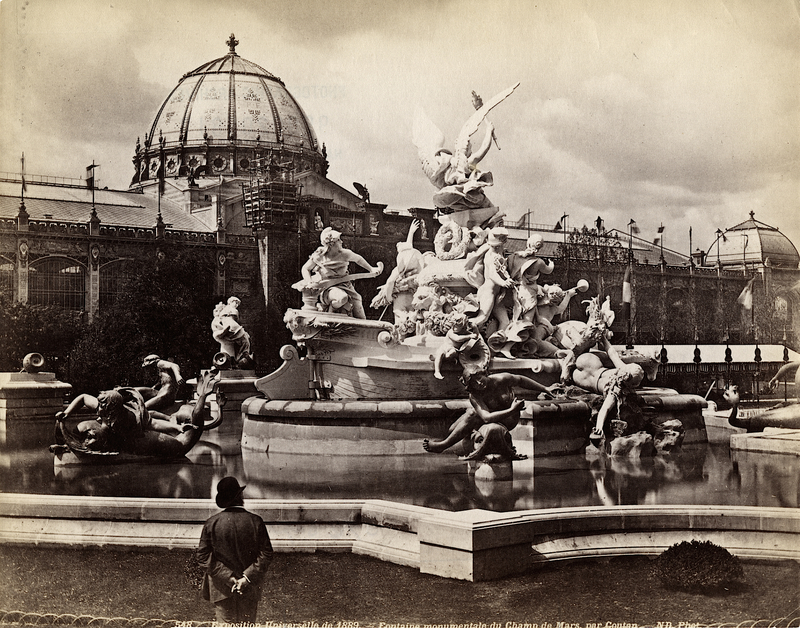 In the 1889 Paris World’s Fair, for instance*****, a fountain known as the Fontaines Lumineuses used the effect to produce multicolored jets of water that dazzled audiences every evening of the fair. 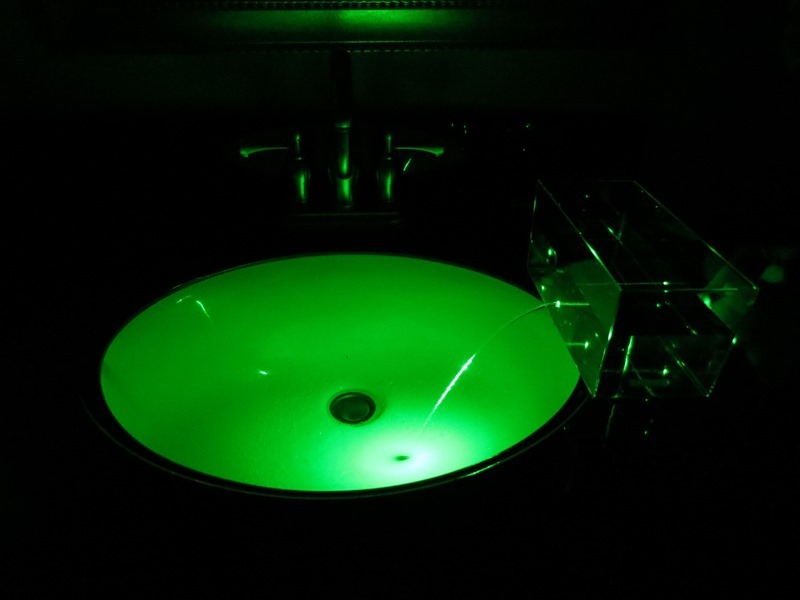 Lights under the water would shine up and through colored glass, producing jets of red, blue, green and gold. Who could imagine at the time that such a simple and beautiful effect would later form the basis of a revolution in communications? * Some of the early fiber optics work received a Nobel Prize in Physics in 2009. ** These days, there is a second type of fiber, known as a photonic crystal fiber, that works in a fundamentally different way. ** Jean-Daniel Colladon, “Sur les réflexions d’un rayon de lumière à l’intérieur d’une veine liquide parabolique,” Comptes Rendus 15 (1842), 800-802. *** Jean-Daniel Colladon, “La fontaine Colladon,” La Nature 12 (1884), 525-526. **** The 1889 World’s Fair also introduced the Eiffel Tower, which ended up having its own unique place in the history of science. This entry was posted in History of science, Optics, Physics demos. Bookmark the permalink. I got very exited when I saw the reflection pattern in the jet of water. Loved the article. In particular because I always thought that Claude Shanon was the one who proposed (1948) light traveling through a medium. Although now I realize he was talking from the perspective of telecom and this had been done before that. He was referring to this I suppose. Thanks for commenting! I’ll have to look into Shannon’s role in the birth of telecom; it is certain that Colladon didn’t have the slightest notion that his little “trick” could be used in such a society-transforming manner.